Her recorded music and live performances played a highly significant role in the creation of rock, with Elvis Presley, Jerry Lee Lewis, Johnny Cash, Little Richard and Chuck Berry all claiming her guitar playing and singing performances as an inspiration. Sister Rosetta might not be a household name; however, as a young woman during the 1940s through the Sixties, she rocked it out. Born in 1915 in Cotton Plant, Arkansas, Rosetta Tharpe created her distinctive style of singing and playing at age 6, when she was went with her evangelist mother to Chicago to join Roberts Temple Church of God in Christ. At 23 she left the church and moved to New York where she was signed by Decca Records. For the next 30 years, she performed to huge crowds in venues across the U.S. and Europe and recorded more than a dozen albums. 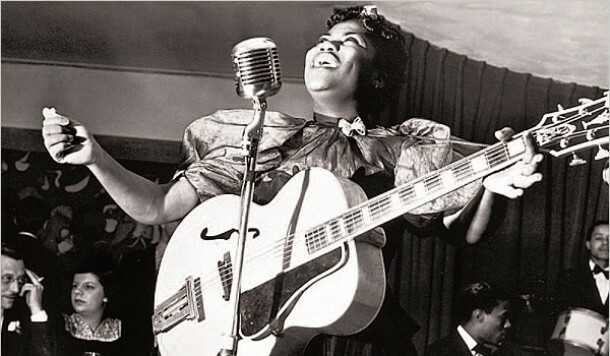 Sister Rosetta Tharpe Godmother of rock and roll. Sister Rosetta died in 1973, and not much video exists of her today. However, what you see here is incredible. The performances were filmed in the 1960s, feature Rosetta playing her ’62 Gibson Les Paul guitar. She’s playing “Up Above My Head,” in the first video, a church standard with an added guitar solo, with a full gospel choir clapping their hands in time to the music. In the second video, Rosetta plays “Didn’t It Rain.” It was recorded in an an abandoned train station just outside Manchester, England, in 1964. Rosetta’s remarkable musical legacy is no doubt considered significant to those who know of her impact on modern music. Update: Sister Rosetta Tharpe was among the artists announced Wednesday as the newest Hall of Famers. Tharpe was inducted as an early influencer.